Getting the best sleep, no matter where you are will improve your health and wellbeing. That even includes when you are going camping! On your quest to find the best backpacking pillow you may be shocked to learn that there are dozens out there. In fact, a quick search will pull up 30 or more camping pillows on your standard shopping website. Your standard backpacking pillow comes in a variety of sizes and styles. You can choose a pillow for backpacking that is inflatable, compressible, or that has any number of special features. As you’re traveling with it, you’ll want camping pillows that are lightweight and easy to carry with you when you’re on the go. An inflatable pillow is a good choice if you need a pillow for backpacking for this reason. Compressible pillows also excel in the area of size. That said, you have plenty of things to consider when searching for the best backpacking pillow! Manual Inflating vs Self-Inflating: You can get a camp pillow that self-inflates or you can deal with blowing one up each night. On the plus side, if your hiking pillow blows itself up, that’s less work for you. Of course, a hiking pillow that self-inflates is heavier to carry in the long run. On the other hand, a manual inflating camp pillow takes little air to inflate and weighs next to nothing when not inflated. Weight: Again, you’re going to be on the go so you want something that you can pack tightly away that won’t be felt until you need it. This is why a manual inflatable pillow is a good option if you’re hiking or backpacking. It weighs little, can be tucked in your pack in the small spaces, and is easy to inflate when the time is right. 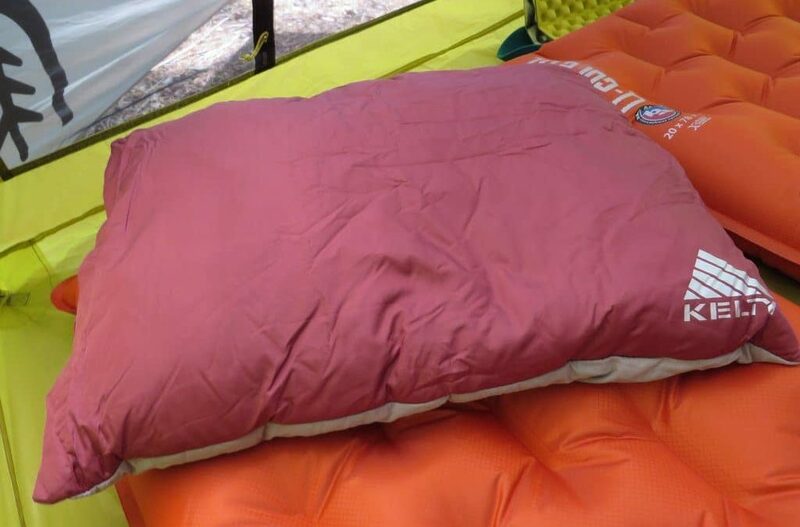 Sleep Style: The best camping pillow is going to offer some contouring. The reason that this is important is that backpacking pillows can be small. While it’s always important to find a pillow that matches your sleep style, in the case of hiking pillows, the contour will ensure that your head remains comfortably on the pillow at night, as the pillows themselves tend to be fairly small compared to regular pillows. 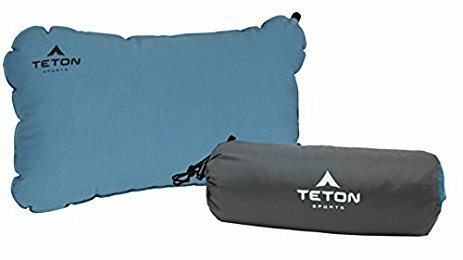 The Teton Sports ComfortLite is a great option for a portable pillow. The great thing about Teton is that it’s a great pillow for the price you’ll pay. As this is a self-inflating pillow you won’t have to worry about blowing it up when it’s time to take a rest. Coming in at around 12 ounces, it’s not the heaviest pillow, but also not the lightest. Backpackers will appreciate the reusable bag that the pillow is packed in. The soft microfiber cover will feel smooth and comfortable, while the underside has a non-slip surface to keep your pillow in one spot! Cleaning your pillow is as easy as wiping it with a warm cloth. Should anything happen to your Teton ComfortLite pillow you’re even covered by a limited lifetime warranty! Click here to learn more! The Sea to Summit Aeros Pillow comes in a variety of sizes, which is something rare in the world of backpacking pillows. The outer fabric is made of a brushed poly-knit which is both durable and soft. There is a synthetic fill between the case of the pillow and the air bladder. This ensures you’ll receive added comfort and it also wicks away moisture. The contoured design will cradle your head and keep you comfortable at night. The bottom edge of the pillow features a scalloped design. This allows you to sleep on your side, on your back, or even sitting up. The edge will center the pillow over your shoulders no matter your position. 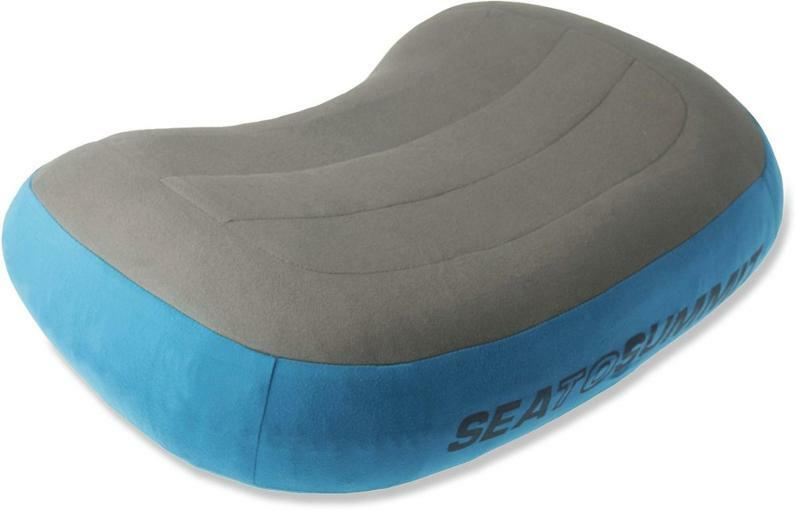 The Sea to Summit is a manually inflating pillow, but can be inflated with just a few breaths. Click here to learn more! 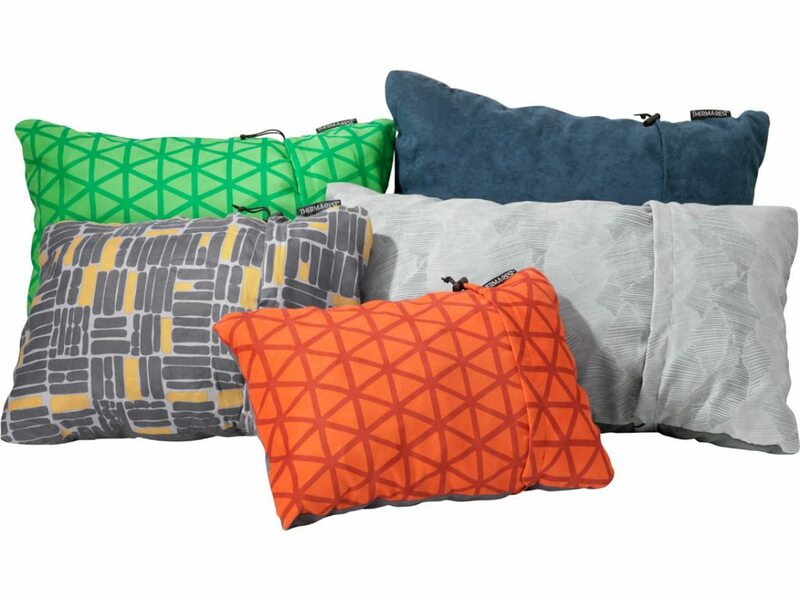 The washable, compressible Therm-a-Rest pillow comes in a variety of colors. In fact, there are as many as eight colors that you can choose. The Therm-a-Rest is filled with upcycled mattress foam. It’s compressible and gets down to a small size, making it easier to travel with. When it’s at its full size it will expand to four inches. This will give your head and neck support in a variety of sleep positions and settings. Therm-a-Rest pillows are secured with a drawstring when not compressed. This compact design means you can place it in your backpack or carry it just about anywhere without it being a hindrance. Click here to learn more! These are just a few of the options out there, but any of them could be the best pillow for backpacking for your needs! Make sure to check these and others out until you find the one that’s right for you!